Drones seem to be regularly under attack, sometimes from lawmakers, and often from disgruntled neighbors. But rarely do we see it under attack from the air. Let’s change that, shall we? Australian photographer Adam Lancaster was taking his DJI Phantom out for an aerial stroll through the bushes of Victoria when a winged guardian of the skies took exception to its presence. 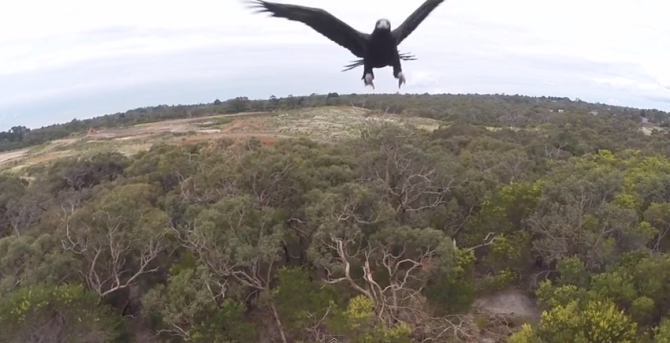 In exciting footage of the encounter, a Wedge-Tailed Eagle flying nearby is seen attacking the drone midair, sending it plummeting to the ground. Getting up close and personal with wildlife is a wonderful thing (did my good deed for the decade last night by rescuing a baby rabbit from one of our dogs and returning it to its nest), but it’s always preferable when your equipment goes undamaged. Lancaster cautions drone pilots against flying when birds of prey are out, not only because of the damage it can do your equipment but the harm it could cause to the bird. According to Lancaster, the eagle was not harmed in the impromptu making of this video, but his drone did suffer some damage that needed repairing before taking to the skies yet again. Fortunately for him, the damage was minimal and was easily fixed for the grand sum of $12. « Can You Tell How Many Photos Can Each of These Hold? Scott Manthey, Keep an eye open for big birds. Here’s something to keep in mind when flying drones: http://discover.umn.edu/news/science-technology/bears-appear-unfazed-drones-their-heart-rates-soar-u-m-research-shows. It appears drone use in the wilds does more than take pleasure out of somebody’s walk in the woods. Drone use is not without consequences. que bueno a la verga!